1. The teaching of maths at Highbury Grove: I haven’t taught maths myself for years but I line-manage the department and I’ve observed 12 Maths lessons in the last two weeks all by different teachers, spanning a range of topics, ages and ability levels. 2. Our inaugural Transition Forum for Maths where some maths colleagues at Highbury Grove met with maths coordinators from a number of our feeder primaries in what we hope will be the first of many. 3. Engaging with the mathematical struggles my children experience at home, revising for tests or doing homework. In all three contexts, I’ve found it fascinating to consider the areas of maths that children find difficult and the processes we need to consider when teaching them to overcome these difficulties. It seems to me that, when children struggle, the key challenge is to get the balance and sequencing right between time spent building more secure routines and time spent developing more secure, fundamental mental models. Sometimes, the fundamentals emerge after lots of practice; sometimes the models need to come first for the routines to make any sense. The really tricky bit is that this varies for different concepts and different learners. I don’t have a neat set of proven strategies here; I’m just going to share some of the things we’ve been discussing. It’s more a list of questions and observations than solutions. If you teach maths you may find all of this blindingly obvious but, here, I’m an outsider looking into your world. At our Transition Forum, this was a key topic. We discussed the reasons behind children arriving to Year 7 without secure knowledge of their tables. From the primary perspective, this isn’t for want of trying. Routine recall tests are ubiquitous; they practice them all the time. Some HGS teachers are using times tables tests as lesson starters (one recent example being the excellent Times Tables Rock Stars developed by Bruno Reddy https://ttrockstars.com/ @MrReddyMaths) ; even at KS4, not every student is secure. Crucially, the insecurity is strongest in division mode (eg 56÷8=7). There seems to be a need to remind students of the mechanics of multiplication (eg array of 56 made from 8 rows of 7) as well as locking in rote recall. When students in Y8 are struggling with short division, they’re often confused by the language; they use 56 divided 8 and 8 divided by 56 interchangeably; the idea that finding ‘ how many 8s go into 56’ is the same as ‘divided by’ isn’t obvious to everyone. It’s more tricky when they are faced with remainders: eg how many 8s go into 54 – being able to see quickly that it is 6 with a remainder. Weaker students still count up..8,16,24,32,40,48…56 is too far – which slows them down enormously, as opposed to homing in on 48 as a known multiple and then finding the remainder. A suggestion from one primary teachers was that tables should be learned four ways all of the time, all mixed in. 8×7, 7×8, 56÷8, 56÷7. We don’t do enough division early on so some children might see the operations as separate. Rote chanting and all the wall charts that count up in 5s, 6s and so on, don’t emphasise the reciprocal patterns or the divisions enough. Dividing by 10. Place value and knocking noughts off. In one lower set at HGS, I was fascinated with the struggles over this. 70÷10=7; 40÷10=4 no problem. But 10÷10? Baffling. How could it be 1? The idea of a number being divided by itself seemed to throw them. How many 5s in 5? It just seemed weird to them.. they wanted so say 5? There’s just five. Not 1. One 5 in 5; one 10 in 10 – this isn’t obvious to everyone! In terms of the method, we’ve talked about the understanding of dividing by 10 in terms of shifting the decimal point, moving down in powers-of-10 base units and the practice of knocking noughts off. There’s the awkwardness that a deeper method based on place value leads to students writing 70÷10= 7.0 which isn’t appropriate for integers – but the ‘knock a nought off’ short cut works, even though it is less rigorous as a general rule. Adding units and currency added another dimension. £8 divided by 10 yield incorrect answers of £0.8 and ‘8p’ instead of £0.80 and 80p. Meanwhile 8kg ÷10 is 0.8kg. The need for the extra zero for currency but not for other units is a source of confusion. 10% of 10 is 1: What’s 20% of 20? The problem with 10% is that it is a special case where dividing by 10 is the same as multiplying by 10/100. If students repeat the wrong pattern, they get confused. I saw 20% of 20 as 1 (20/20) and 2 (just multiplying up by 2). The link from percentages to fractions is important here: 100= 5×20; 20% is equivalent to 1/5; 25% to 1/4 and so on. Repeated mechanical operations with 10% can undermine rather than reinforce the general concept. This is tougher than it looks. If Something bought with 30% off costs £84, how much was it originally? Recognition that the £84 is 70/100 or 0.7 of the original is needed. The intuition that the answer is £84÷0.7 isn’t that straightforward. Conceptually it is easier to go through £84 = 70%, so 1% is £84/70; then 100% is then 100 x the answer. However, with increases (eg the wages went up by 12% to £280, what were they before) some students seem to struggle with the ‘find 1%’ model; it’s easier for them to see 1.12 as a scale factor to divide by. There’s something about dividing by numbers smaller than 1 that makes students doubt themselves whereas dividing by a number bigger than 1 seems logical. How intuitive is it that 2/7, 3/10, 4/10 and 3/7 are in ascending order? It is if you convert to a common denominator ( 20,21, 28 and 30 70ths respectively) or decimals – 0.29, 0.3, 0.4, 0.43. The jump from slices of pie and shaded squares in a grid up to the number line is really important and sometimes difficult to make. I find that some students have a weak mental model of fractions as decimals; that ability to estimate relative value. For some it’s as though 5/8 has no actual size – it is just a sum to perform. I’ve said in another blog post that the number line is probably the most important diagram of all time; a trick seems to be to make students as happy with the 0.00 to 1.00 scale as they are with the 0 to 100 scale. It’s more of a leap than it should be at first glance. My son asked me recently what -1÷ -1 was. He said ‘do you just cancel the minuses or is it true because any number divided by itself is 1?). We talked about multiplying both top and bottom by -1 (ie by the same thing) so that you get 1 ÷1. Then he could see how it all linked. He was losing the logical link with other operations after repeated application of the ‘minuses cancel’ short-hand. This happens with simple rearrangement of equations. x + 2 = 10 leads to x = 10 -2. Often students and some teachers talk about ‘taking the 2 over to the other side’ instead of the more fundamental idea of ‘subtracting 2 from both sides’. Similarly with something like x = 60/ y; This means that xy = 60. We have not just ‘taken the y over to the other side and put it on top’; we’ve multiplied both sides by y. I think we need to careful not to lose the fundamentals in the short-cuts because students come unstuck later on. Another one of these is with common denominators and cross-multiplying when adding and subtracting fractions. With students who are struggling with adding fractions (even in Y11) it’s fair enough to focus on the drill: cross-multiply because it works every time. 3/4 + 5/11 will be found by writing (3×11 + 5 x4)/44. It works. However, the fundamentals of finding a common denominator by appropriate selection of a multipliers for both numerator and denominator – can be lost. That understanding is necessary for some algebraic fractions and higher order questions where cross multiplying makes things more complex instead of factorising the denominators and simplifying. A final area under this category is in column subtraction versus chunking. If you’re asked to find 328 – 189, it’s easy to break it up: 11 up to 200, + 100 and a further 28 makes 139. Done. However, this isn’t always sensible or easy so the column version with borrowing and carrying of 100s, 10 and units is important too. How much time to give to each method? That’s a tough one with lots of variables but it must be both in combination. Equations. Putting the numbers in; the concept of variables. As a physics teacher I know full well that some students benefit hugely from repeated use of triangles like S=D/T and V = IR. They can use them in different arrangements to bang the numbers in long before they really understand the physics. Voltage and Current are basically ‘electricity’ to lots of people who can still use V=IR. Similarly, in maths, in our discussions we’ve considered whether the concept of forming equations for a new scenario needs to be modelled lots of times before it makes sense in terms of the general concept of ‘variables’ and algebraic substitution. Find the Salary for d days paid at £12 per day. S = 12d; Find the taxi fare F if it’s £10 per journey plus £3 per mile m; F = 10 + 3m. And so on. Once you see lots of these in action, the concept seems clear. But if you start with the concept, it can seem a bit abstract. The concept of proof is fascinating. It was great to see the parallel lines proof in a lesson last week. I don’t know if the exterior angles proof is any more fundamental than the alternate angles proof – and they both require some ground work to show that some basic concepts are defined and don’t require proof. In the appropriate context, they’re both worth doing as is the simple but wonderful act of ripping all the corners off ANY triangle so show they form a straight line. But before you explore any specific proof, it seems that you need to explain why things needs to be proven at all. The angles in a triangle add up to 180 because they just do; it’s a fact we’re told. That’s where kids often start from. It was interesting to see students struggle with text-book questions linked to formulae that were posed as “Show that” S is £36 if the man works for 3 days. They wanted to use the number 36 in the calculation rather than see this as the answer to be found. ‘Show that’ isn’t intuitive it appears. Powers of 10...scaling number bonds up and down. I’m interested in the extent to which students find it hard to move beyond certain limits of numbers even though all the basic patterns are replicated at higher or lower orders. 33 and 67 are bonded to 100 (if that’s the phrase); 325 and 675 are bonded to 1000. So far so good. 303 and 697 – got it. But 3034 and 6966 as bonded to 10000 or a similar delve into decimals can seem confusing – especially with stray zeros. My feeling is that children spend too long in the comfort of the 0-100 range at an early stage; that is probably because it feels necessary to secure understanding there as a platform. However, I’d suggest we need to be bolder and Go Big and Small earlier. In a Y8 science lesson last term I was asking students to imagine how many atoms were in small droplet. They went from a million to a billion to 10 billion… but then they could only imagine multiples: 20 billion, 30 billion… no longer going up in powers of 10. It was as if they’d reached a conceptual ceiling with how big numbers can get. That was fascinating. Beyond about 50 billion it was just “really really big; bigger than I can imagine”. And the same goes the other way. I could go further: vector addition and first order differentiation were two of the other topics I observed being taught last week. The same general pattern of thought applies. What are the fundamentals? What are the short-hand drills? Where do we begin… letting the deeper understanding emerge from the routine practice or to go deep from the start? I think that what matters is that, whichever route is chosen, it is done deliberately. Similarly with all the other conceptual challenges above; if we know where they might be, we might be better prepared to help students overcome them. 1. Level 6 Maths at KS2 – what’s the problem? 2. Owning the problem is part of the solution. Is there any point in being able to “bang the numbers in long before they really understand the physics. “? ‘Definitely. Over time the meaning emerges because the numbers begin to make sense. I’ve seen that over and over again. You can’t always get the concepts straight first. Of course the triangles are a crutch that needs to be pulled away but they have their place. As an experiment I taught my son (now agreed 36) Newtons laws by rote when he was 2. I noticed he learnt a lot of nursery rhymes by mimicking doing not understanding the words so why not the Laws of Motion. Over the years I associated those sounds with his experience of the world. This happens because of N2 etc. By the time he was 10 he could explain most every day events in terms of Newton’s laws. No, he isn’t now a physicist, he’s a sound engineer and owner/manager of a night club :-). What this taught me was the way little children learn is very different from how adults learn. Adults are too ready to extend their own feelings about learning to children. Children are not necessarily interested in the things an adult intuitively thinks are interesting and are not necessarily bored by approaches adults think would be boring. There is research evidence to back this up eg when Sesame Street was being made. So I agree, the obsession with having to understand at the same time as remember is misguided. Wish we had one of those maths transition things in our neck of the woods. It’s true, we really do go on and on about timetables. Timestables rockstar really helps ( sorry I’ve no idea how to do links on a blog using an iPad and the teenagers are all elsewhere). Our kids ( at school-not my own!) love it so much they asked if we could have a lunchtime times table rockstars club! Once they know them a bit then findthefactors.com good ( if hard to navigate). And my personal favourite for using and applying x and / facts: solveme mobiles (solvemme.edc.org). Yes yes yes teach x & / together- via arrays and the bar model. As well as times tables posters have multipack displays. ie a column of egg cartons to show all the multiples of 6, 4 packs of tins- bottles to show multiples of 4 etc. hard for prime numbers but there is a teaching point in itself. So I need 36 cokes and they come in packs of 4- I wonder if 36 is a multipack/ multiple of 4 or will I have to buy too many to be sure I’ve got enough? I need 6 eggs- I wonder how many boxes I need to buy? Actual objects work better than pictures because they are so familiar. But pictures somewhat more manageable! As for fractions, decimals, percentages then these are all so easy if you use a bar model. See greatmathsteachingideas.com recent post on this. Great for proportion and ratio too. Our students are. Our stronger on these topics than anything else! If you came into my school and told kids to knock off a zero to divide by ten we’d drum you out the building! Doesn’t work for decimals. Integer counters for negative numbers. Solvemme mobiles again for beginning algebra. Multiplicative reasoning is hard. We make models using dienes up to a million – well cheating a bit- no one has that much dienes. So 10, 000 is 10 thousand blocks masking taped into a tower. 100,000 is the tower flat on the floor plus metre rulers making up the rest of the square that is 100, 000. Then more metre rulers and masking tape to make a million cube. Not my idea- there’s a video on the every child counts website somewhere of a bloke called Andy doing it with a group. Then ask children to imagine a ten million stick, a 100 million square, a thousand million cube….. My husband teaches decimals with ‘pixie’ dienes. Here we are taking mega- dienes. We great if a secondary technology department could actually make some blocks for 10,000 upwards. Make a great hanging display in an atrium or big hall. Or inflatable ones so we could actually make really Big numbers…. I once did some thing using the reduce function on the photocopier. They drew 10 hand each with 10’fingers. Reduced so we could easily fit 1000 fingers onto one sheet, then reduced again to fit 10,000 on etc. not the quickest of activities. Used to be dead against column methods but have learnt to love them via place value discs. They should know how to mentally partition via exposure to number lines too though. I think there is a growing consensus that we need to teach the procedural and conceptual aspects side by side. In the push for higher standards the danger is teaching short cut procedures that may enable shallow performance while masking lack of deep understanding. I have a favourite maths staff meeting idea where I teach the staff how to do differentiation ( very few primary school teachers have A level maths- I have to google it each time to remind myself if I take away or add the little number and then is it multiple or divide and is that the one where you add c????) 10 minutes later everyone can differentiate but no one has a clue what on earth they are doing ( myself included- I knowmits something todo with the area under a curve but why/ how???). Then we try and answer an A level question and of course fail miserably. Point made about procedural understanding by itself being of limited use. But that does not mean conceptual understanding on its own is any good either. Thanks. Brilliant detailed response. Our primary colleagues talked about dienes too. We talked about how the physical tools (they had a better phrase – concrete resources?) seem to disappear in secondary – where some students may still benefit from them. Thanks for the contribution. ‘Concrete manipulatives’ is the buzz phrase. AKA kit. It’s not just for struggling secondary kids-NCETM has videos of yr 7’s creating expressions that factorise using kit. ‘The effects of manipulative materials in mathematical instruction’ Elelyn Sowell concluded that for up to and including college students the long term use of manipulatives in the hands of teachers who understood how to use them to support pedagogy increased achievement and attitudes. Pictures and diagrams on the other hand no more effective than just symbols. No idea how valid this research is, mind. Hi there, really interesting post as I can relate to many points in my own setting. I am a class teacher and maths leader in an infant school and nursery. From the highest abilities to the lowest, concrete representations of maths are essential for children to truly grasp the often abstract concepts we try to teach. Number in itself is an abstract construction of ‘amount’, with each number represented by symbols. Try to do some maths with Chinese numbers and immediately we struggle! In our school, we see it as imperative that children understand, know, recognise and explore the patterns of number facts (bonds to 10,20,100,1000, adding/subtraction and times/divide) and how they interlink. Children gain their building blocks of maths understanding in KS1 and I believe true conceptual understanding is far more important than simple repetition of strategies. Yes the HA of your class will recognise and repeat the strategies learnt, they will probably do well in SATs etc, but do they have a deep conceptual understanding of the maths? Can they reason, explain and generalise about the rules/patterns? Can they relate this knowledge to other settings? Sorry to go on but this is why we use numicon/dienes/other concrete apparatus for all children in all number and calculation lessons certainly. Like you said, sometimes we will get children to learn the concept through exploring apparatus first, sometimes the model/strategy will be taught first then the knowledge deepened afterwards. I have a high expectation (my class are year 2, but I have done this in reception up) that children will be able to explain and sort answers, explore hypotheses, generalise over rules, explore and justify these. Unless children are doing these things in a maths lesson, then I don’t believe they have that deep or profound learning of the topic. And actually, the new maths curriculum demands this of teachers. So to sum up, standards in Maths (infant schools certainly) will go up if you explore patterns, rules and concepts through the use of more concrete apparatus followed up by problem solving, rule making and testing, reasoning etc. sorry for the long post, any thoughts? That makes total sense. Thanks for adding this comment. No worries, thanks for posting. My twitter is @ConorHeaven – do you think I might be ready soon to write my own blogs? Still just reading others, seeing how it is done and building my confidence before jumping in! I truly believe what I am seeing on Twitter is making me a better, more reflective teacher and I want to go to that next step! Go for it… If you have something to say (which you clearly do) you are ready! 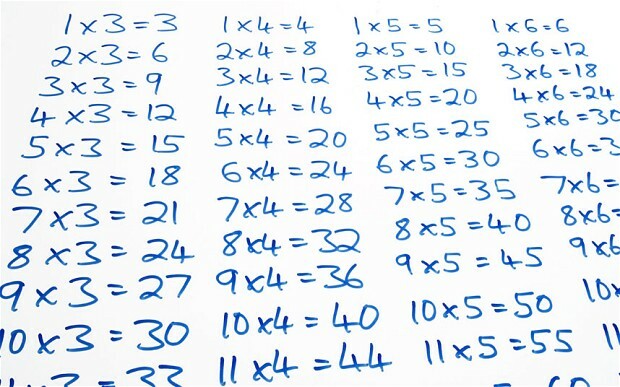 Tom offers some sound thinking behind learning ‘those times tables’ borne out of observation. A blog I’ll be sharing with our maths team.